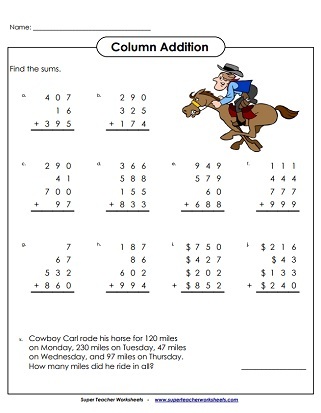 Printable column addition worksheets. These printable feature one, two, three, and four-digit numbers. Look for mistakes in these completed addition problems. Explain the errors. Then solve. These problems were incorrectly solved. Students must explain the mistakes, then re-solve the problems correctly. Here's a fun code math activity your kids will enjoy. 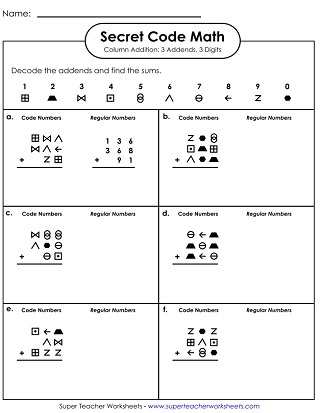 First, students will use the key to decipher the graphical symbols in the addends. Then they solve the problems. What do you call a skeleton that won't work? 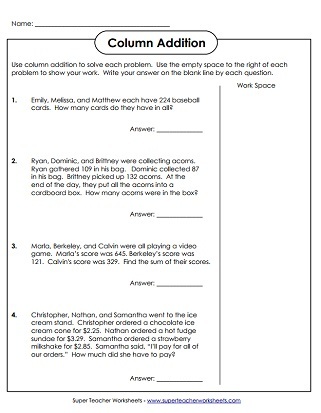 To find the answer to this riddle, students solve a series of 4-digit column addition problems. These problems have four addends with 4 digits. The problems have already been completed, but there are mistakes. Students must explain the errors and solve the problems correctly. In this secret code activitiy, students will use the cipher key to decode sets of three or four addends. Then they'll find the sum of each set.